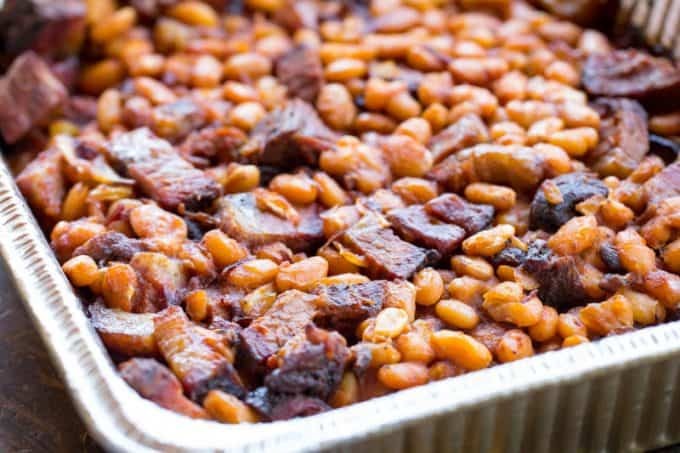 Traeger Baked Beans with Brisket are scratch-made wood-fire smoked baked beans in their own homemade tangy sauce, with the added bonus of having cubed brisket added into the mix for extra flavor. 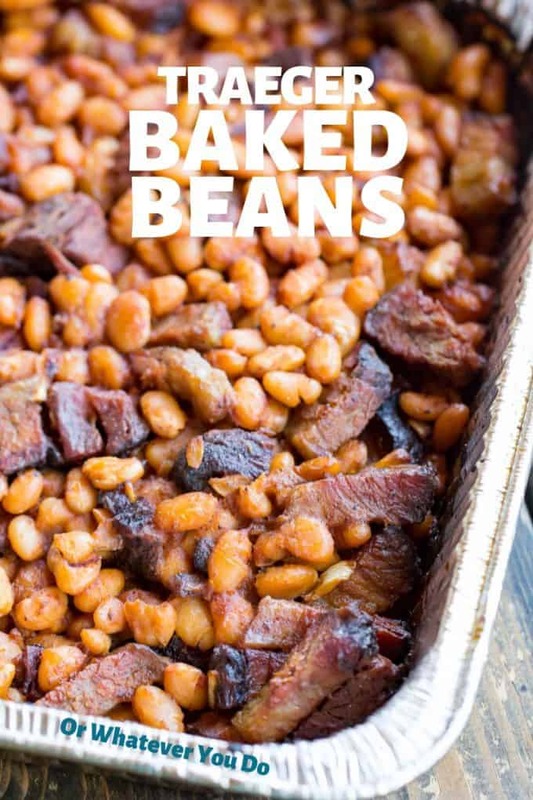 Using leftover Brisket instead of ground beef or bacon, these wood-fired baked beans feature northern beans, ketchup, brown sugar, mustard, tomato sauce, vinegar, and Spiceology seasonings in the homemade tangy sauce. 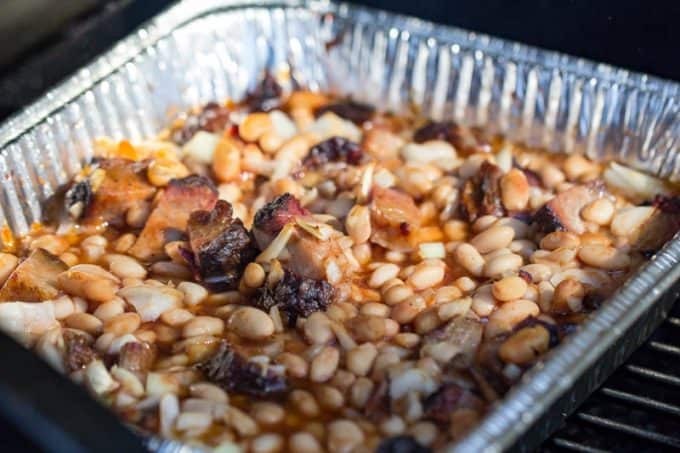 My baked beans are done on the Traeger Grill and are an excellent side dish for any barbecue, cookout, potluck, or family gathering. What kind of beans should I use for homemade baked beans? 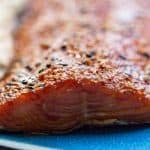 In this recipe, I’m using Great Northern Beans. You can use other varieties of beans, in fact, whatever you prefer. A lot of recipes call for Navy beans which also would be amazing. I like the Northern Bean because it has delicate skin and flavor and can be used in many different recipes, such as soups and chili. If you prefer pinto, go for it! You can use a variety of your favorites too if you want to add different colors to your Baked Beans! In other words, almost anything goes! Brisket is a cut of meat coming from the breast or lower chest of the beef. Brisket is also used when making corned beef and pastrami. 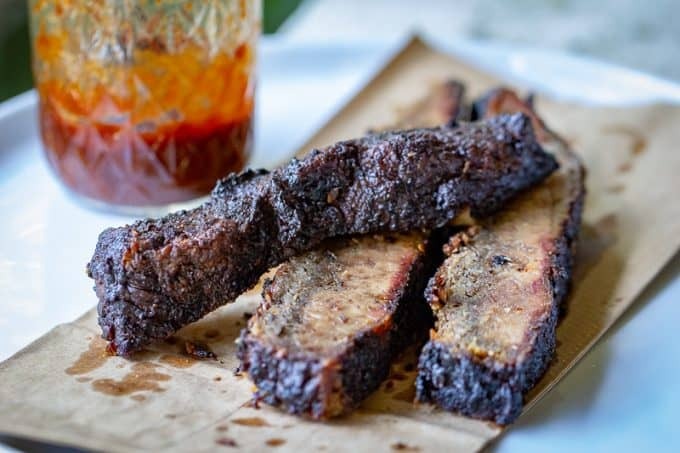 It is generally known as a tougher cut of beef, but when smoked, braised or slow cooked you will get a delectable, tender piece of meat that is perfect as a main dish, or for stews, chili, or this recipe for my homemade baked beans with brisket! Cooking Brisket should be done at a low temperature (around 225 degrees), and slow. The time frame depends on how many pounds your brisket is. See my post for Traeger Smoked Brisket for details and a GREAT recipe! Try this recipe and use the leftovers for these Baked Beans. What other kinds of beans are there? These are a list of the most common beans used in cooking. 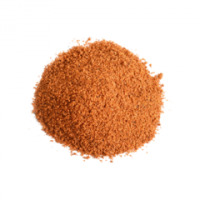 There are more varieties that are used in other kinds of recipes. You could use almost any of those beans to mix in with these baked beans, but I’d stay away from the chickpeas if I were you. Why Brisket instead of ground beef? 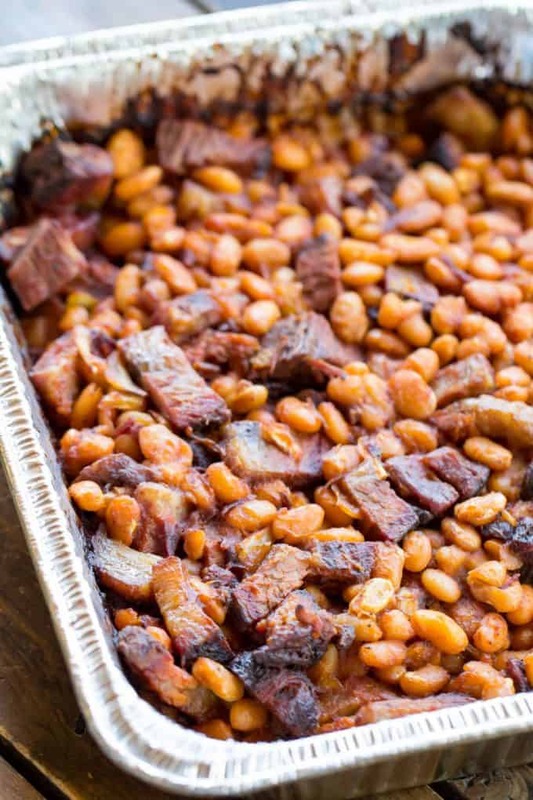 The smokiness of the leftover Brisket adds to the complexity of the flavors that go into these homemade baked beans. 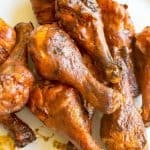 Feel free to add your own twist to this easy recipe if you’d like! 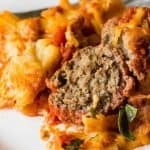 You could also add ground beef if your family prefers lots of meat. 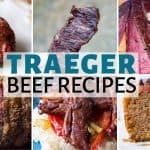 What should I serve with these Traeger Brisket Baked Beans? How about starting off with an appetizer such as my Traeger Bacon-Wrapped Shrimp. 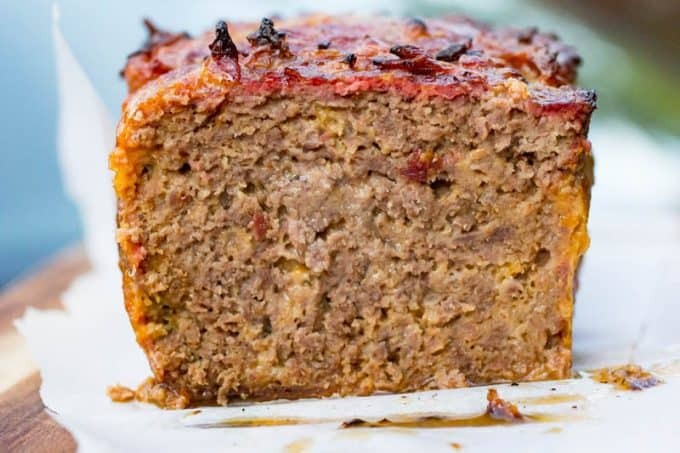 Then, start your main event with my Traeger Cheeseburger Meatloaf or my Traeger Grilled Stuffed Burgers! These main dishes will be perfect with these Traeger Baked Beans with Brisket! If you want to go a different route? 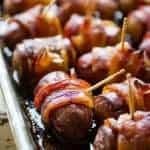 How about my Traeger Jalapeño Poppers for an appetizer with a little “pop” to get the everything started. Then on to your main course: Traeger Smoked Ham! Oh mouth-watering, I LOVE ham! And Baked Beans are a perfect side dish to serve with ham. 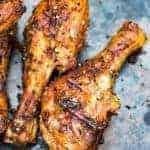 Do you want to go with chicken? 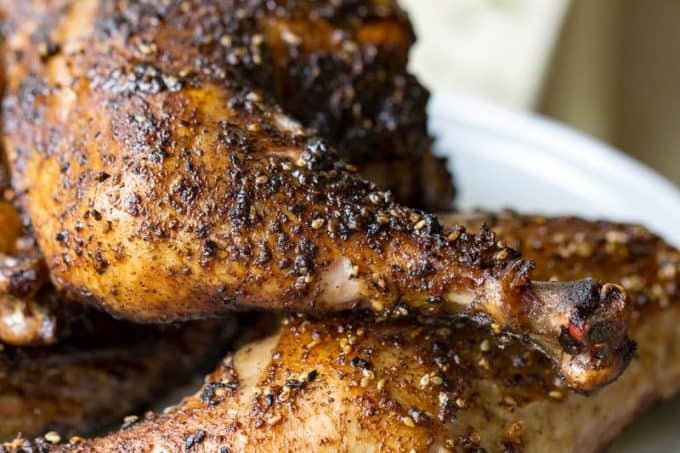 How about trying my Traeger Grilled Chicken Leg Quarters? Another great combination! Whatever you decide to grill will be DELICIOUS! We all know that EVERYTHING tastes better when cooked on the grill in the great outdoors! Then for the finale? 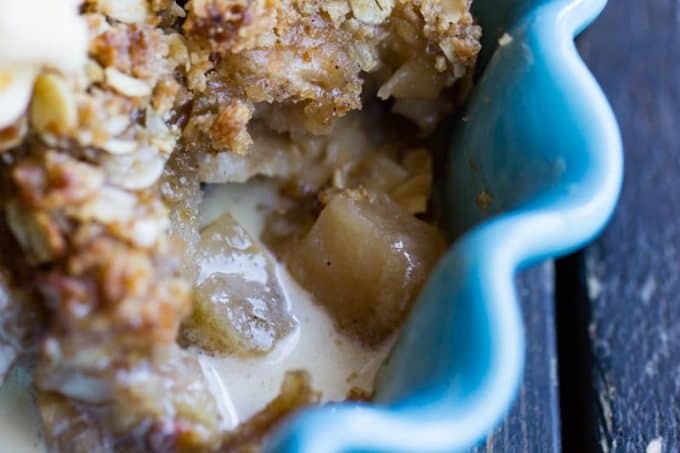 Try my Traeger Apple Crisp! There is nothing better than planning an entire meal on the grill! No mess in the kitchen other than prepping, no heating up the kitchen for HOURS, and minimal dishes to dirty! WINNING! 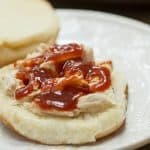 Easy ways to save you time so YOU can also enjoy your meal and visit with your family and friends, which is the whole point right? 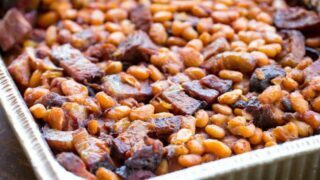 These delicious homemade baked beans feature copious amounts of homemade brisket it the match to give it an extra meaty, smokey flavor that you'll be tempted to make into a meal. 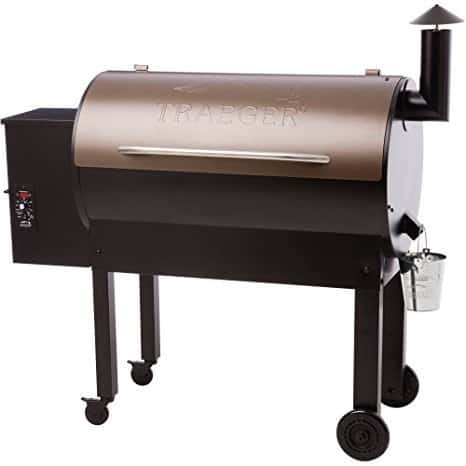 Preheat your Traeger grill to 325° following factory directions. Prep a high-sided foil grill pan with cooking spray. 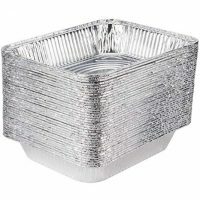 You can also use a 10x13 cake pan as well if you don't have the foil grill pans. Mix together all of the sauce ingredients until combined. Pour the beans, brisket, and onion into the pan. Top with the sauce and stir gently. 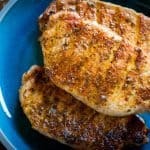 Put the pan on the grill, shut the lid, and go do something else for 25 minutes. Stir gently, and go away again. Cook for about an hour, or until the sauce is thickened and reduced and everything is bubbly and melded together.